Couple of days back I passed “VMware Cloud on AWS Management Exam 2019 (5V0-31.19 )” and I thought, it is worth to share my preparation experience with you. Once we pass the exam, we get below skill badge from VMware. As per VMware, skill badges indicate developing competencies and a broad understanding of an individual’s capabilities and accomplishments. Why I chose to write this exam? Exploring more on VMware cloud on AWS has been on my radar since quite some time now. When I came to know about this VMware cloud on AWS management exam, I thought to use this opportunity to take my skill around VMC to the next level. Usually I like exams not to just get the badge or to be certified but I use them as motivation in my preparation/learning journey. As per me, what counts more is what we do during the moment we decide to write the exam and the moment we start attempting the exam. Preparation journey should be the focus. Exam and its objective/syllabus help us streamline or direct our learning properly. Side note: There is vBlog voting for 2018 is open, if my blog or any other blog helped you, please go ahead and vote. Your vote would be motivation to generate even more quality content. Below are the resources I used. Though there is no strict course/training requirement for this exam but VMware recommends a course i.e. VMware cloud on AWS: Deploy and Manage . I was lucky to undergo this course. It is fine if you could not complete this course from exam perspective. However, from learning perspective, any time formal course is really insightful. I highly recommend to complete this Hands On Lab. Please do not underestimate this lab. Very helpful for exam as well as learning. I was able to access one of internal VMware cloud on AWS labs as well. It is fine if you do not have your own lab. I was really impressed on FAQs compiled on official site. Once you have some hands on experience, these FAQs are really worth to go through. It not only covers general FAQs but it also focuses on each VMC component/feature. From exam perspective, it is good to just have basic idea on what AWS compute & storage options available. It is not required to undergo any course or training. If you want to learn more on AWS, I found this blog post interesting i.e. AWS in plain English . There are couple of pluralsight courses are useful as well (not required for exam itself). Yes, it is assumed that you have fundamental knowledge on vSphere, vSAN and NSX. Exam format, level and scheduling? If you take a look at Exam preparation guide , it is about VMware cloud on AWS fundamentals. Accordingly exam also was inline with sections listed in the guide. There are 30 questions to be solved within 45 min. All are multiple choice questions. 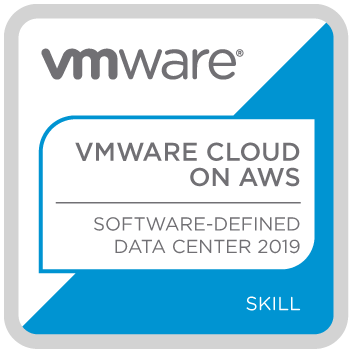 Once we pass this exam, we get “VMware Cloud on AWS – Software Defined Data Center 2019” badge. Passing score is 300. My score was 411. This exam is un-proctored i.e. you can attempt from your own laptop browser and once scheduled, you must begin the exam in 2 days time (i.e. you can attempt any time during those 2 days). Voucher I had received was valid for 2 attempts. Additional VMware Cloud on AWS resources that I found useful for your further learning. Follow William and Emad blogs , they write great VMC blog posts. VMware cloud official site. Please do not underestimate this site, tons of info available across all the VMware cloud services. I hope this blog post would useful in your learning journey.